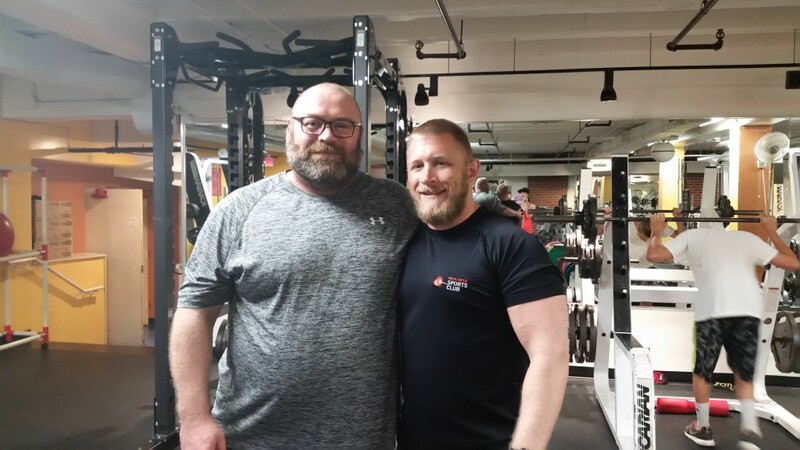 When it comes to making positive changes in your life, it really helps to have a good attitude, and anyone here at Rock Creek Sports Club will tell you that Joff Pincher has one of the best. With his upbeat personality — along with his hard work and outstanding progress— Joff was an easy choice for our Rock Creek Sports Club Member of the Quarter! Joff, who’s a 52-year-old stay-at-home dad with twin 4-year-olds, says he was also looking for ways to combat diabetes, and he had read that strength training would be very beneficial. So in addition to joining the gym, he also signed up to work with RCSC Personal Trainer, Zach Tolchin . Joff works out with Zach twice a week now, focusing mainly on strength training, such as squatting. In addition to these sessions, with guidance from Zach, Joff also works out on his own 2-3 times a week, with free weights, plus some cardio work. Since joining in February, Joff has lost 45 pounds, reduced his medication to 10% of what it was, and his blood pressure has dropped. These awesome results are especially encouraging for anyone on the fence about joining a gym. Is this the same Joff who I knew from Manchester UK? If so I’m kee to reconnect!